This unique ring has a snake that rotates and swivels! 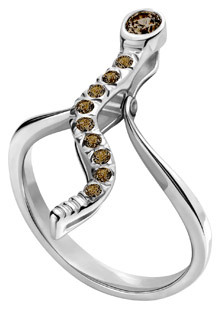 This 14K palladium white gold snake ring is made from Harmony Metals and is available in sizes 5-8 (whole sizes only). This ring has one .08 ct chocolate diamond on the head and nine .005 ct chocolate diamonds along the body.